Well, the house belonged to my dad and seemed to be a part of his heart. We sat up many nights watching the weather channel worrying about it. I needed complete closure and freaking out every time a storm was going to hit that area was only causing more grief. Even considering selling it was heartbreaking and for some reason made me feel like a traitor. He also had several boats and every kind of fishing equipment you can think of. He was an avid fisherman and even tried to teach me. :) When I gave it all away to his friend and curator of the house I was free. I'm no longer worried about getting on and off the island and wondering where the house landed when it blew away. The Planetary Defense Commander is concerned; concerned that the tracking models are being crushed; crushed by what? So much data and outsparking exceeding three standard deviations that the super computer is starting to have involuntary spasms; hiccups. as long as it don hit fla again i lapsed my homeowners insurance. only thing i worry about was same as irma hurricane movin slow up west coast of florida jus offshore gettin energy from gulf on left side then poundin coastal cities on right side that the nitemare scenario. This will be a catastrophic event unlike anything seen in the Atlantic basin in recent decades. Expect horrific flooding in and around the Appalachians and Katrina-like devastation within 50 miles of the NC coast. Flooding in the mountains usually kills more people than the initial impact at landfall. We are basically in Philly so we are watching this one carefully. 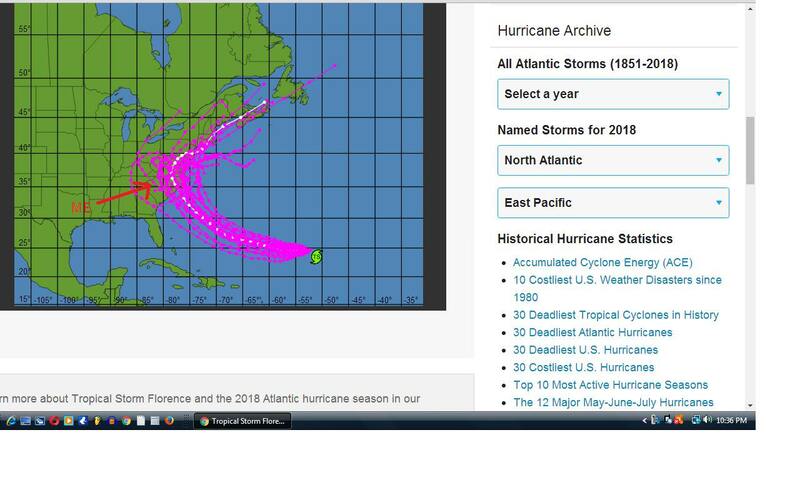 Latest weather channel ... and weather forums ... say CAT 4 landfall on OBX (outer banks). Then up the coast inland ... Hugo style. Honestly, I listen to the amatures in the weather forums more. They know what's going on and they are not under constraints to say things a certain way ... etc. Anyways, I just got back from restocking my candle supply and 10 cases of water from Lowes (4$ a case). As you know, my good lady, I am also in Philadelphia. Wasn't aware though that "Florence" was on track to maybe head up this way. I'm conflicted as to how I feel about it. I don't want my city and/or our surrounding communities to be inundated with all the consequences that come with a natural disaster. But hurricanes are fun. :) Or...they can be. Growing up on Cape Cod I lived through several. Once the lights get knocked out (and they always do, lol...) suddenly it becomes going-camping-while-still-at-home. Basically everybody stays up late and plays board games by candlelight. It's fun. Will you evacuate if ordered? If not make plans to die. I like my plan better, where everyone plays board games and the biggest threat to civilization is possibly forgetting to put the candles out before falling asleep. We refused to leave and after Sandy the looting in my neighborhood got so bad the National Guard got called in and they stopped it pronto. Before the Guard there was about 3 days when I had loaded guns around the house. Power was out so I did armed patrols while wife got some sleep. Middle of the night some jacked up pickup truck stopped and I came close to shooting him because he never saw me until he realized he was at the wrong end of a loaded gun. He took off pretty fast. Ammo. You can never have enough. The rains didn't match the flooding event in the financial district of Manhattan. I suspect it was a heist cover event by intentionally flooding the the subway and basement floors. As I recall there was an unprecidented closing and relocating of the gold vault under a bank. I had been following the story back then but it's rusty to me now. But it seems they either moved the gold from the NY FED to Chase Manhattan's basement or from that bank to the FED's basement. Around this time, there was a big deal going on with Germany wanting their gold and China wanting theirs and what had been turned over being plated tungsten and yer whatnot. So, I theorized that the pocket news people were being made to trump up the storm and make it seem like it was this hugedy huge SUPERDUPER storm of the Century when it was no such thing. It was a storm chosen to make people believe it was responsible for the flooding but it was actually a man made event by the people who do flood control of the city and state. And was used as a rationale for the transfer. I want to think there was a Chinese angle to the story as well since they had apparently just before this bought the bank building. I'm glad you were able to find closure in that way, MM.